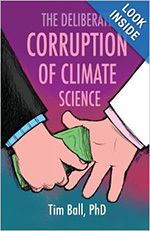 "It is the greatest deception in history and the extent of the damage has yet to be exposed and measured," says Dr. Tim Ball in his new book, "The Deliberate Corruption of Climate Science." Several UN conferences set in motion the hoax that is based on the assertion that carbon dioxide (CO2) was causing a dramatic surge in heating the Earth. IPCC reports have continued to spread this lie through their summaries for policy makers that influenced policies that have caused nations worldwide to spend billions to reduce and restrict CO2 emissions. Manmade climate change – called anthropogenic global warming – continues to be the message though mankind plays no role whatever. CO2, despite being a minor element of the Earth's atmosphere, is essential for all life on Earth because it is the food that nourishes all vegetation. The Earth has passed through many periods of high levels of CO2 and many cycles of warming and cooling that are part of the life of the planet. "Science works by creating theories based on assumptions," Dr. Ball notes, "then other scientists – performing their skeptical role – test them. The structure and mandate of the IPCC was in direct contradiction of this scientific method. They set out to prove the theory rather than disprove it." "The atmosphere," Dr. Ball notes, "is three-dimensional and dynamic, so building a computer model that even approximates reality requires far more data than exists and much greater understanding of an extremely turbulent and complex system." No computer model put forth by the IPCC in support of global warming has been accurate, nor ever could be. Most of the reports were created by a small group of men working within the Climate Research Unit (CRU) of the University of East Anglia and all were members of the IPCC. The result was "a totally false picture supposedly based on science." The revelations of emails between the members of the CRU were made available in 2009 by an unknown source. Dr. Ball quotes Phil Jones, the Director of the CRU at the time of the leaks, and Tom Wigley, a former director addressing other CRU members admiting that "Many of the uncertainties surrounding the cause of climate change will never be resolved because the necessary data are lacking." The IPCC depended upon the public's lack of knowledge regarding the science involved and the global warming hoax was greatly aided because the "mainstream media bought into and promoted the unproven theory. Scientists who challenged were denied funding and marginalized. National environmental policies were introduced based on the misleading information" of the IPCC summaries of their reports. "By the time of the 2001 IPCC Third Assessment Report, the politics and hysteria about climate change had risen to a level that demanded clear evidence of a human signal," notes Dr. Ball. "An entire industry had developed around massive funding from government. A large number of academic, political, and bureaucratic careers had evolved and depended on expansion of the evidence. Environmentalists were increasing pressure on the public and thereby politicians." Moreover, the hoax was aimed at vast reductions in the use of coal, oil, and natural gas, as well as nuclear power to produce the electricity on which all modern life depends. There was advocacy of solar and wind power to replace them and nations undertook costly programs to bring about the reduction of the CO2 "fossil fuels" produced and spent billions on the "green" energy. That program is being abandoned. At the heart of the hoax is a contempt for mankind and a belief that population worldwide should be reduced. The science advisor to President Obama, John Holdren, has advocated forced abortions, sterilization by introducing infertility drugs into the nation's drinking water and food, and other totalitarian measures. "Overpopulation is still central to the use of climate change as a political vehicle," warns Dr. Ball. Given that the environmental movement has been around since the 1960s, it has taken decades for the public to grasp its intent and the torrents of lies that have been used to advance it. 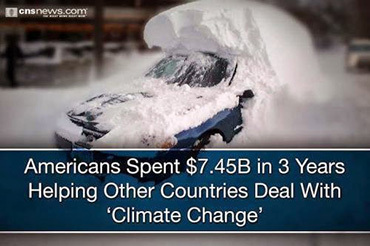 "More people," notes Dr. Ball, "are starting to understand that what they're told about climate change by academia, the mass media, and the government is wrong, especially the propaganda coming from the UN and the Intergovernmental Panel on Climate Change." "Ridiculous claims – like the science is settled or the debate is over – triggered a growing realization that something was wrong." When the global warming advocates began to tell people that cooling is caused by warming, the public has realized how absurd the entire UN climate change argument has been. Worse, however, has been "the deliberate deceptions, misinformation, manipulation of records and misapplying scientific method and research" to pursue a political objective. Much of this is clearly unlawful, but it is unlikely that any of those who perpetrated the hoax will ever be punished and, in the case of Al Gore and the IPCC, they shared a Nobel Peace Prize!